Clever Beauty ~My 9 Favorite Summer Beauty Items for Less Than $15! Summer is here and it’s time to whip out those warmer weather beauty products! 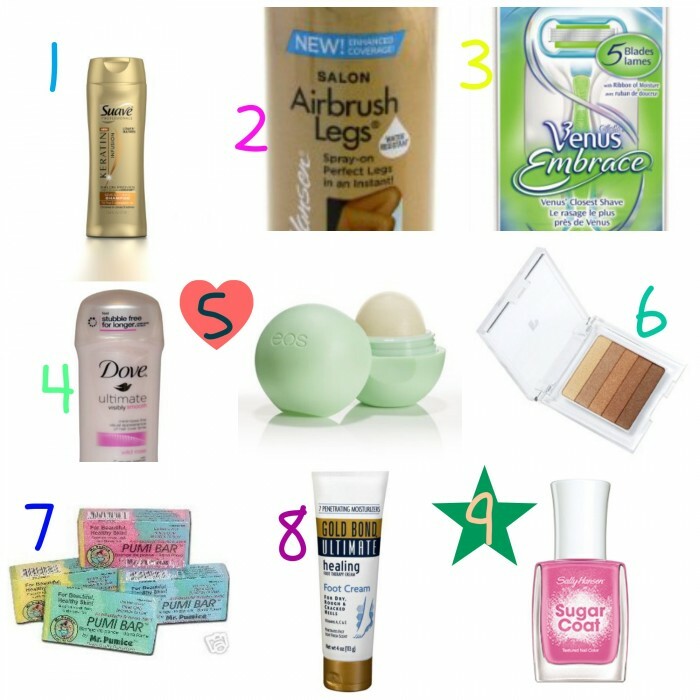 Here is a peek of my favorite beauty items for Summer from drug stores and Amazon for less than $15! Suave Keratin Shampoo and Conditioner ~ Walmart $2.88 each ~ I’ve heard so much about Keratin that I wanted to give it a try but the hair care products can be pricey! I have had a good run with Suave professionals so I thought I would try these. I can say after years of trying to find shampoos and conditioners that would soften my long hair without weighing it down, I finally found a reasonably priced product! Sally Hansen Airbrush Leg Light Glow ~ Between $11 and $13 at Walgreens and Walmart ~ I’ve seen a lot of mixed reviews of this Sally Hansen leg “makeup” online. I bought it a month ago and love it! I think the problem that many have is not knowing how to use it.l You do not spray it on to your legs directly. You spray it into your hands, then rub your hands together then swiftly mix it into your legs like lotion. Once your legs are covered, take a damp washcloth and blend any lines in and finish the look by going over your legs with a dry towel to finish the blending. Works like a charm and gives your legs a nice glow (especially great for those with very bright white legs like myself). Venus Embrace Razor ~ $8.97 at Walmart ~ Not the most inexpensive razor out there but the most effective with a smooth finish and minimal razor burns, great for sensitive skin! Dove Ultimate Visibly Smooth Anti-Perspirant Deodorant ~ $3.79 at Walgreens ~ Shave less throughout the Summer time with this deodorant! EOS Lip Balm ~ $3.29 at Walgreens ~ I love soft lips and EOS does a great job of keeping my Summer lips hydrated. Physicians Formula Shimmer Strips, Sunset Strip/Bronzer ~ $11.69 at Amazon.com ~ I don’t always want to put on a foundation during the hotter months but love that I can get a shimmer with this bronzer! MR. PUMICE Pumi BAR 4pcs ~ $4.95 at Amazon.com ~ I’ve used these little scrubbers for a couple years now and for the price, I love them! They keep my feet smooth in between pedicures. Gold Bond Healing Lotion ~ $7.29 at Walgreens ~ This foot lotion is great after a good scrub and before bed time. It keeps callouses from forming and feet soft! Textured Nail Polishes~$6.49 at Target for Sally Hansen Sugar Coat ~ Textured polishes are the new thing this Summer and I love this line from Sally Hansen! Look for my favorite makeup items for Summer coming soon! I am going to have to try some of the Mr. Pumice bars! Kate, let me know how you like them! Sara! I absolutely LOVE numbers 1, 3 and 5. I have been using that shampoo/conditioner for Hannah and her hair is so much healthier even with swimming every day. I will have to try that sugar coat nail polish, I love me some Sally Hansen polish, I’m surprised I haven’t tried it before now! Chrissy, I can’t believe how much I love this shampoo and conditioner! For the price, it is pretty amazing! Let me know how you like that textured polish, they also have a “fuzzy” one where it looks like fibers in a a sweater. It’s pretty cool but I love the sugar look! I love the pumi bars and Gold Bond lotion! Great picks! I haven’t tried the Sally Hansen Airbrush Leg Glow but have been on the fence about color and rubbing off on clothes – I’m definitely going to take the plunge and pick some up now! love this! i love trying new stuff.